AIP Rhubarb Strawberry Crisp ! I mostly stick to fruit instead of having dessert nowadays, which is pretty incredible given the fact that I used to be such a sugar addict back in the days. My friends that have lived with me can attest that. After following the autoimmune protocol for a month, those cravings completely disappeared and I don’t feel like I miss out on anything. But of course, an occasional dessert is something I do enjoy. The problem is that it was almost impossible to find anything that I can eat that tastes as good as what I used to eat back in the days. A few weeks ago I went to the farmers market and saw rhubarb and strawberries there. I have been a big fan of rhubarb crumble cake for my entire life and I specifically remember one of my best friend’s mom’s incredible recipes. So I thought to myself, let me try to freestyle something in that direction that I can eat with all my food sensitivities. 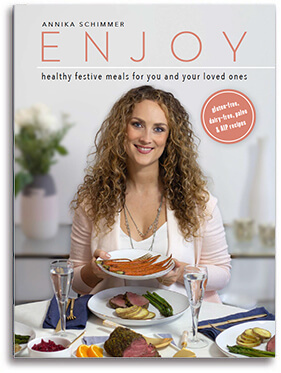 After researching for awhile I could not find any recipes that didn’t contain nuts or dairy or grains. So I experimented with tapioca and coconut flour and this is the outcome of my freestyle. I have to admit that while I was working on writing down the recipe the other day, I ate the whole thing myself. But it was of course all for a good cause, to see how many servings the rhubarb strawberry crisp has 😉 The recipe below is for 6 people because that is how many times I refilled my plate. It is very thin and you will definitely want more. It therefore works for 4 people as well. 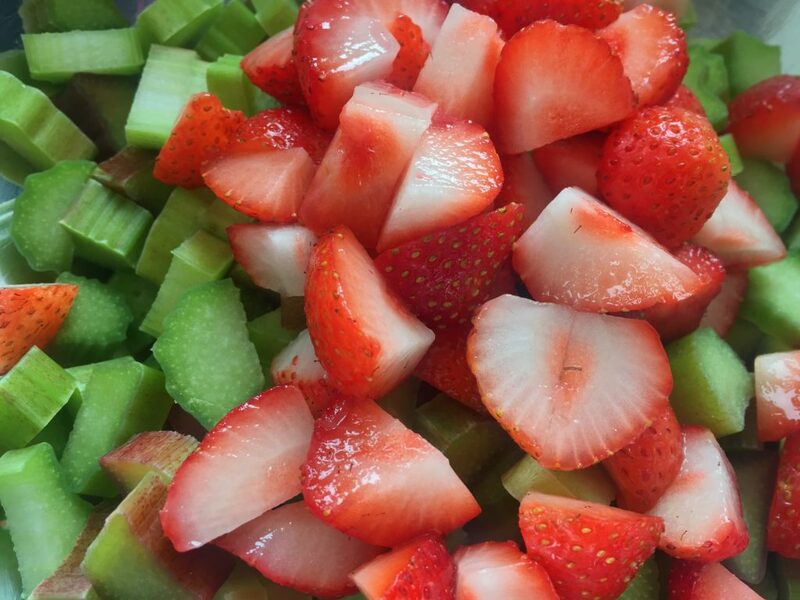 Let the fruit mix soak in the honey lemon sauce for at least 10 minutes. Since the rhubarb/strawberry season is coming to an end, check out my Grainfree Prune Crumble and my Delicious Apple-Crisp. 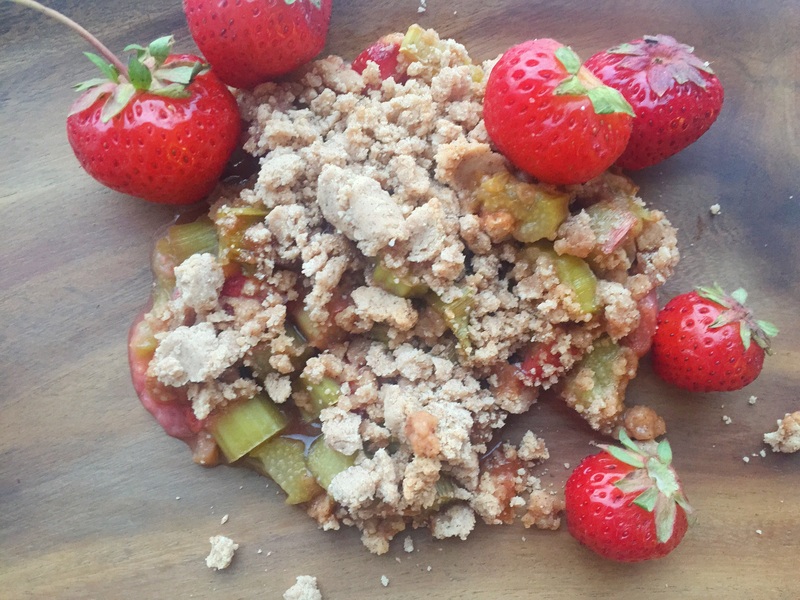 This rhubarb strawberry crisp is a very delicious dessert recipe for the summer months. It is gluten free, dairy free, grain free, paleo and aip friendly. Wash and dice rhubarb and strawberries. 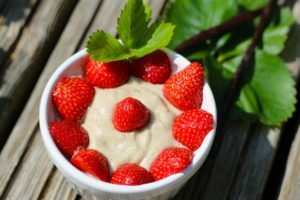 Place strawberries and rhubarb in a large bowl with lemon juice and honey and mix well. Preheat the oven to 350 degrees. Combine tapioca flour, coconut flour, cinnamon, salt and stir well. Add honey and coconut oil and mix until crumbs form. Add fruit filling to a casserole. Finish up by distributing the crumbles evenly on top. Bake for 25 - 30 minutes or until the rhubarb is soft and the crumbles are golden brown. Let it cool for a few minutes before serving. Enjoy!